Let's power on the Christmas lights for DAY 4 of the countdown. An opportunity has been presented to us TMNT fans this holiday season. Sure, we can shout Turtle Power on the internet or wear our gear proudly at comic conventions. But this Christmas, we can decorate our houses with mutant mania! 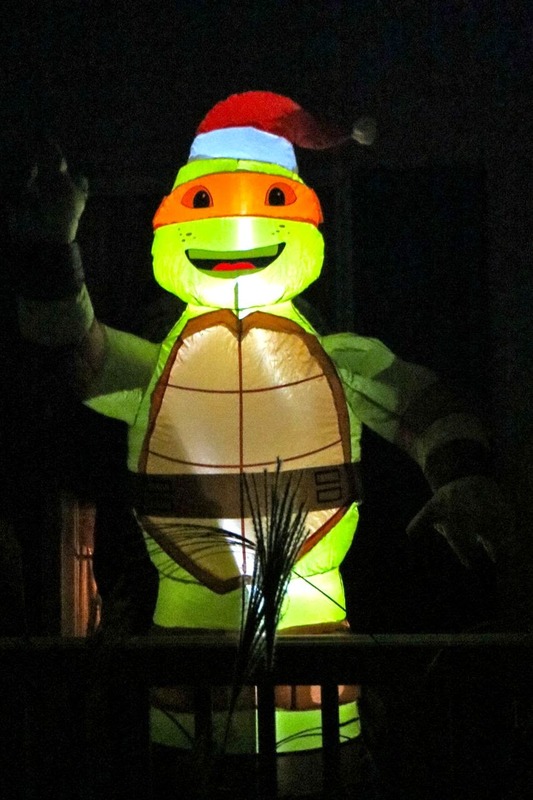 Measuring a whopping 5 feet tall, the inflatable Michelangelo is unavoidable. Prop this guy on your lawn and anyone passing by will be unable to avoid the charm of a giant Turtle in a santa hat. The fan-inflated Mikey rocks in the wind, spreading holiday cheer with his 3-fingered hand waving high in the sky. Even though he's intended for outside use, the ninja looks stellar indoors too. If you have pets, inflate the dude in the middle of your living room to see their reaction. The power of inflatable Christmas chaos! I live in a 1 bedroom apartment in the cramped land of NYC. Unfortunately, there's no space for him here. Having him would be like adding a roommate. So my Mikey is spending the holidays with my parents. They have a giant lawn and a porch, more room for an inflatable Turtle to grow old. Yes, I will miss seeing him daily. But, at least I get to see him on Christmas day. Michelangelo wants to be everywhere this holiday season. You saw what he looks like inflated 5 feet high, but what about on your Christmas tree? Today's gift is a scan of a wooden ornament from the original cartoon series. Print, cut-along the dotted line, and hang this party dude from your tree. Check back tomorrow for DAY 5 of 24 Days of Turtle for more festive fun, gracious gifts, and possible prizes! Until then, stay jolly, dudes & dudettes! Aw, I wish I had the Leo version of this! I saw the Raph stocking in the background. My sister has that stocking... well, she had it when we were kids. She gave it to me. I have the Leo one. Calculating a whopping five feet high, the inflatable Michelangelo is actually unavoidable. Brace this guy on the lawn as well as anyone moving by is going to be unable to steer clear of the charm of the giant Turtle in a santaclaus hat. The actual fan-inflated Mikey rocks within the wind, distributing holiday perk with his 3-fingered hand waving high in the actual sky.